Executive Access Home! Upscale Condo w/GULF VIEWS! Community Pool! LOCATION: This home is yards from the beach. DETAILS: Leisure and luxury are just a couple of the finer qualities that define this fabulous WaterSound condo. Featuring 3 bedrooms, 3.5 bathrooms and accommodations for 6, this upscale condo is the perfect space for a family beach vacation or romantic getaway. The master suite, complete with a walk-out porch, rests on the first floor while the open living area, kitchen, covered porch and additional two bedrooms sit on the second floor. Enjoy the towering, natural sand dunes from the great porch spaces provided. When you aren’t splashing around at the pool that is just steps from your door, take the boardwalk down to the beach for unlimited fun in the sun! AMENITIES INCLUDE: 3 adult bikes provided, Gulf Views, Gourmet Kitchen. This property comes with 1 dedicated parking spot. Additional parking can be found throughout the community. Complete Clean Linen Participant - ALL linens, including comforters laundered upon every checkout. Golf Carts: IMPORTANT INFORMATION BELOW. The unit is lovely and very comfortable. Gorgeous views and easy access to the swimming pool! The entire property is well maintained and the rental manager, Katie, was responsive and very helpful when we needed her. We are so delighted to hear how much you enjoyed your vacation with us in Watersound! We agree that the views from this condo as amazing and we are so glad that your experience with Katie was a positive one, she is one of the best! Thank you for staying with 360 Blue, we hope to see you again soon! Wonderful stay! Very large condo with all the amenities necessary. Feels like you have your own pool. Very tastefully decorated. Convenient to Seaside and Rosemary. The Hub is within biking distance. You can see the beach from the porch but it is a far walk. But, only because we have a 2 year old. We will stay again. We are so glad that you enjoyed your vacation with us in Watersound! 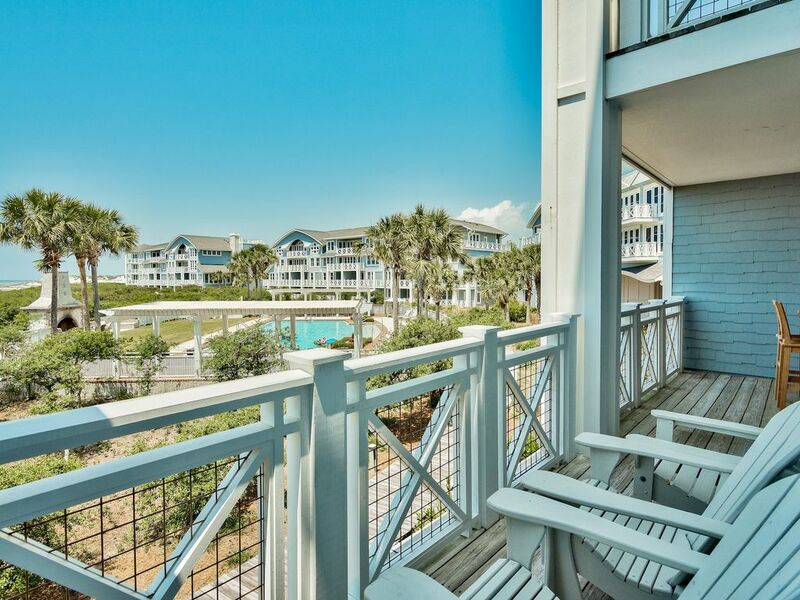 We agree that these condos are a wonderful option for a fun and relaxing vacation thanks to the amazing view from this condo and the spectacular amenities that Watersound has to offer! We look forward to seeing you all again very soon! We enjoyed the apartment except the bottom floor was extremely hot and the bed in the master bedroom had a very very uncomfortable Mattress that I would suggest they need to replace. The outside table was uncomfortable no chair cushions. No broom as well as I requested the blind and outside chair was broken. Chair wasn’t fixed or replaced. The toiletries and towels were not enough for the five people. Also, it was cumbersome to get to the beach. Will not return to this unit. We are so glad that you enjoyed your stay in lieu of some issues experienced during your stay. We apologize for the Adirondack chair not being fixed or replaced during your stay, we were awaiting owner approval before anything could be done. In regards to the broom, we do show a member of our team dropped one off when requested on August 2nd. We will share your valuable feedback with our team to rectify these issues for future guests. We hope you are able to visit our area again soon. What a beautiful beach photo! We love seeing all those smiling faces! We are thrilled that you and your family had such a wonderful vacation in WaterSound! We are so sorry that the water was not our normal emerald green color and we hope you come back to experience the true emerald coast color! Thank you so much for staying with 360 Blue and we hope to have you back again soon! Another great year on watersound beach. Second year in this same condo. This is our favorite family vacation spot. We spend all day at the beach and go back at night for kids to catch crabs. Condo is great fully equipped kitchen, comfy beds. Internet doesn't work well because they need a new router. We love the beach chair service, but were disappointed that the new company selected by HOA is almost double the cost from previous years. So beach chair set up is expensive. This is a beautiful beach photo! We are so happy you enjoyed your stay so much at WaterSound! We do apologize about the beach chair prices, as it is set by the HOA, unfortunately there isn't much we can do to change that on our end. Thank you so much for staying with 360 Blue and we hope to have you back again soon! We had a wonderful week at Watersound, our condo was clean detailed and in excellent shape. We were within walking distance of the hub, had a great time there. Thank you for everything we would gladly rent this unit again as a family. We are so pleased to hear that your group enjoyed your stay with us so thoroughly! Thank you so much for choosing 360 Blue for your family's beach escape, and for taking a moment to share your experience with us. Be sure to come back and see us again soon!